Lift your research to the next level and apply now! 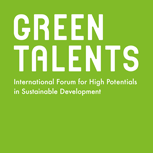 more: Interested in the Green Talents Competition 2019?. 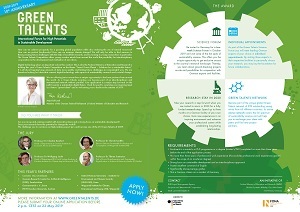 Have a look at the sustainability hot spots our Green Talents winners of 2019 are going to visit during this year’s Science Forum in western Germany. more: Science Forum 2019. Meet our expert jury consisting of Prof Dr C. Kemfert, Prof Dr C. Liedtke, Prof Dr W. Lucht and Prof Dr T. Santarius, who will choose the Green Talents awardees of 2019. more: Jury 2019. Sustainability and digitalisation are two of the biggest buzzwords in our society right now. Together, they constitute a key field of research with great potential. more: Sustainable digitalisation. Find out how Precious spent her last summer at the Potsdam Institute for Climate Impact Research (PIK). more: My Research Stay: Report by Precious Akampumuza. Rama joined the German Center for Environmental Health (Helmholtz Zentrum München) for his research stay. Read more about his experiences. more: My Research Stay: Report by Rama Kant Dubey. The American Society of Agricultural and Biological Engineers has named six young members to its class of 2019 "New Faces of ASABE – Professional". One of them is Green Talent Femeena Valappil. more: Latest news.